A widely asked question is if dogs really are colorblind. Dogs are in fact colorblind. However, it is misinterpreted to say dogs see no color, but only shades of gray. Dogs do see color, just not as many colors as humans can see. Because dogs have fewer cones than humans, the colors dogs see are not as rich or intense. Instead of seeing the rainbow as violet, blue, blue-green, green, yellow, orange and red, dogs would see it as dark blue, light blue, gray, light yellow, darker yellow (sort of brown), and very dark gray. 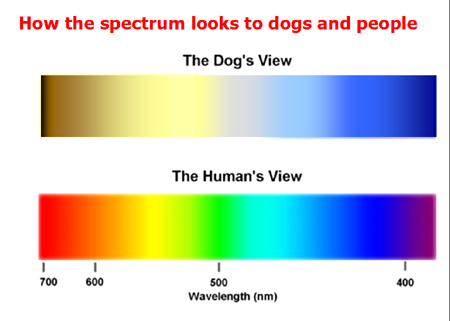 In other words, dogs see the colors of the world as basically yellow, blue and gray. They see the colors green, yellow and orange as yellowish, and they see violet and blue as blue. Blue-green is seen as a gray. In comparison between dog and human vision, people are better at depth perception, color perception and seeing quick details of an object. Dogs are better at seeing in dim light, responding to an image quickly, detecting the slightest motion, and have better peripheral vision. If anyone has dogs, I have two boxers, you've noticed that the popular colors for dog toys are red and orange. This is funny because it is very hard for dogs to see red. Red can appear to be a very dark brown, gray, or black color. So the next time your dog runs past their red toy and you think they are stupid, consider it your fault for picking a colored toy that your dog has a hard time seeing. I can admit I was one of the many people who believed the popular myth; "Dogs are colorblind." It was extremely interesting to learn that dogs actually do interpret colors; such as yellow, blue, and gray. Like you had mentioned, a countless number of toys for dogs are the colors red, orange, or even pink. I have a Black Labrador Retriever and his 3 toys are all red, therefore; it really does make an immense difference that he is seeing the toys as "dark brown" on my dark hardwood floors. As a result, I can now understand why sometimes it is difficult for him to distinguish his toy from the floor. Conversely, it is true that dogs can detect the slightest motion, and have a much better sense of smell than their counterpart, humans. Therefore, even though dogs cannot see things are clearly as humans, they can detect where their toy is located by their skillful sense of smell. Thus, even though a dog may not be able to see as accurate as a human, they sure can smell a lot better than us! I thought that dogs interpret colors the same as we do, it was very intersting to find that dogs interpret colors differently. I have a dog and I have bought a few red toys to Rocky, but thanks to your informative blog I know better now. We have better vision than dogs but their sense of smell and the rapid way they detect motion is amazing! I knew dogs had a different interpretation of how they see things than we do but its interesting to find out they have a different color vision. I have a half pitbull and half puggle dog, thanks to this I will make sure not to buy him a red toy even though it wont last much but I will get him one he can see the color. Wonderful blog. I have always wondered about dogs vision of color. I have heard the saying " dogs can't see color" but i was never a believer. I feel much better now that you have told me that my Dixie girl can in fact see some colors. Im throwing out the red toys and going to buy her blue and yellow toys :) Thanks for the information. I loved this Blog! I always noticed that my dog never played with certain colored toys however I never knew the reason why. The fact that ther are only drawn to reds and yellows really explains alot. I loved this blog!